A lot of times, facebook games send game requests out automatically. I personally don't send game requests unless I know you like them and I'm really choosey which games and apps I use. There are only a few games on facebook that don't track you. If you are playing Candy Crush and the "________ville" games - you are surrendering your privacy every second you play. While I recommend not playing games at all on facebook - remember - free is NOT really free - they make money by selling your profile data, friends data, and your "gaming statistics", including tracking you … you can prevent others from sending you game requests easily. Just block the games. Most everybody plays the same games. After about a month of performing the steps below, you should get relatively few gaming requests. I only get about one a month now and I have a lot of facebook friends - 10x more than most of you. 2) Visible in the small red area (circled for you to notice) is an X … click it. 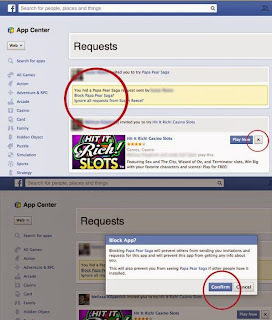 3) Choose "Block _______________ game"
4) Confirm. Once you do this with the popular games (ie Candy Crush) you'll eventually only have a request every few months. Tip #2 … pay attention! Choose "skip" when a facebook app asks if it can post to your profile or share on your friend's wall. Greater than 50% of the viruses I am removing from computers these days are making it onto your computers via facebook games. Note: facebook itself is benign, but know that most "pages" are marketing companies - collecting data on you. LOTS OF DATA! Tip #3 … Screenshot pictures and memes and re-upload them rather than sharing. Credit the pictures if you like.